HAILEY, Ernest Miles (1877-1951). Brother of Thomas Clarence Hailey (below) and Managing Director of Sunfilms Ltd, a London firm which franchised, equipped and supported walking pictures photographers, including one such business in Cambridge in the 1930s. See our page on Walking Pictures in Cambridgeshire. Subjects, styles, advertising, other relevant information: Thomas Clarence Hailey appears in the 1891 Census as a photographer at 51 Ordnance Rd Marylebone, where he was living with his younger brother, Ernest Miles Hailey (b: 1877 Clare Suffolk). Clarence Hailey (wrongly transcribed online as "Harly") appears in the 1901 census listed as a photographer, an employer, resident at The Laurels, Stetchworth, Cambs with his wife Eva M (b: 1873 London), and daughters Pauline M and Violet M. In the 1911 census Clarence had moved to 199 Ewell Rd, Surbiton, Surrey, where he was still listed as a photographer and an employer working from home. As at least a part of his work Clarence photographed racehorses. He was also a racehorse owner and bloodstock exporter. Offered for sale on Ebay in May 2017 was an engraving of the racehorse Florizel II, J Watts up and trainer R.Marsh, from a photograph by Mr Clarence Hailey, St John's Wood and Newmarket. A number of his photographs are held by the National Horseracing Museum at Newmarket. Clarence was succeeded at his Newmarket studio by Frank Thomas Griggs, who had been his employee and studio manager. 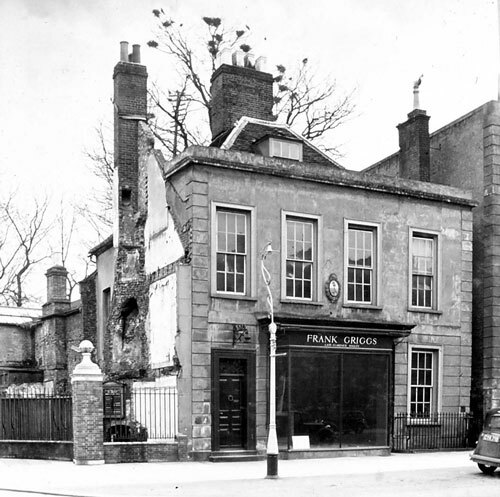 Below is a photograph of his shop in 1939, then occupied by his successor Frank Griggs, on a site now occupied by the Post Office. (photograph reproduced by permission of its owner Peter Norman). Obituary Times February 15 1949 p 6. Subjects, styles, advertising, other relevant information: Fred was the son of a general shopkeeper and chemist. In the 1911 census Fred Hall is shown as a photographer working from home at 46 Westgate Peterborough on his own account. His wife, Annie, (b 1882 Peterborough), was also working from home on her own account as a ladies hairdresser. At some point around January 1915 Fred worked with John Borrill Etches - a real photograph postcard has been seen of a parade of soldiers on the Peterborough Market Square dated Jan 1915 marked "Etches and Hall copyright". Similar attribution is printed on the face of a series of RPPCs of groups of Belgian refugees in Peterborough during WW1. The Peterborough Directory 1912, 1922. Subjects, styles, advertising, other relevant information: Harry Hall appears in the 1891 census lodging at a house in Regent Street Cambridge, the home of carman and horse keeper Alfred Pearson b: 1856 Horseheath. Harry's occupation was shown as a photographic artist. In 1901 Harry was a photographer based in Newland Street Witham, Essex. He had married, his wife was Emily Maude Hall, b: 1866 Salisbury and their two children were Gilbert Wigg b:1894 Colchester and Margorie May b: 1898 Witham. By 1911 Harry and family had moved to Keighley Yorkshire. Harry was still a photographer, employing others and living at 59 Cliffe Street. His son Gilbert Wigg Hall was an apprentice photographer. Subjects, styles, advertising, other relevant information: In the 1911 census Roy Hall gave his occupation as a photographer working on his own account from his home at Town Street Upwell. He was living there with his mother, Lily Hall b: 1863 Saxmundham, widow and dressmaker, and his two sisters. According to the 1901 census, when the family lived at Kirkley Suffolk, Roy's father, Frederick C Hall, b:1854 Yoxford Suffolk, was a watch maker, working from home on his own account. According to Kelly's Cambridgeshire Directory of 1916 there were either two Roy Halls in Upwell, or a single person with two unrelated occupations. Roy Hall was listed as a cycle agent and dealer and also a fruit grower. According to the 1939 register, Roy was still living at Town Street Upwell, with his wife, Louisa b.1894 and son Bertram b.1919. In 1939 Roy gave his occupation as a petrol filling station master and his son was a drawing Office Apprentice (electric). We are most grateful to family member John Wick for the following personal account of his ancestor. "Roy Hall was my great uncle, the brother of my grandfather. He was the third of four sons of Charles Hall; my Grandfather was the oldest and Roy had two sisters. As a young man, Roy had a cycle business. 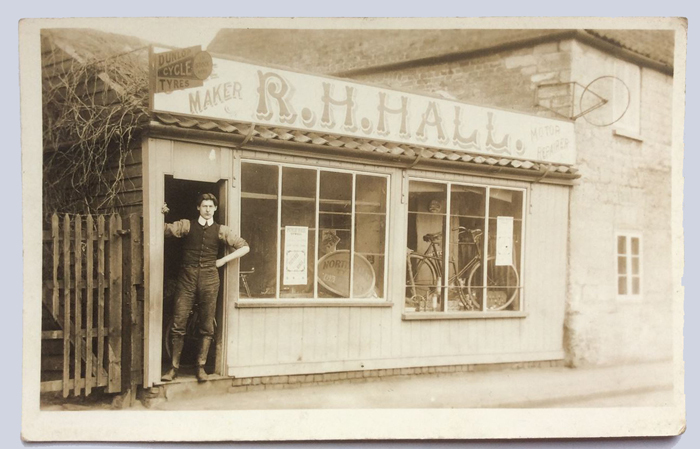 Below is a photograph of him standing outside his shop in Upwell. I believe the photograph was taken by Roy's mother. Roy then ventured into motor repairs and sold petrol to motorists in cans. He then had the first petrol pumps, hand pumps, and tanks installed in front of his garage near the Baptist Chapel. He built a kind of bungalow on the banks of the river beside the garage. His wife’s name was Louie and his son's name was Bertram. Bertram was quite influential in his job as a designer at Hotpoint in Peterborough and lived in Wisbech for most of his life. Roy also bought kits for valve radios, assembled these and sold them around the area. He supplied fuel to the local lorry operatives who took daily loads up to the flower, fruit and vegetable markets in London. He was let down financially by some wealthy people in the area. He retired, I think, in the late 1940s or early 1950s and moved first to Wootton, near Kings Lynn, then to Oulton Broad, and finally back to Wisbech, the childhood home of his wife. Roy's time as a photographer may have been short-lived; I was not aware of it. The only connection with photography that I can recall being mentioned was that he took 9mm cine films. I never saw them, but my late parents did". Address: Cambridge - moving away in the 1990s, currently lives in Hertfordshire. Working Dates: c.1970s to date. Subjects, styles, advertising, other relevant information: Roy set up his company Weeping Ash Ltd (art2science) based in Chelmsford in 2005. The company provides web, design, illustration and photography services for science & academia, business & commerce, and artists & craftworkers. They are one of the few firms in the UK maintaining a traditional photo-darkroom alongside digital work. They undertake archival silver-based printing of black & white photographs for private clients and galleries and also restore old photographs. After studying photography at the University of East London, Roy now has over forty years experience in photographic, design and visual communication work. His previous employers were University of Cambridge 1970-84 and Merck Sharp & Dohme 1984 - 2005. Roy was one of the original founders and Directors of The Cambridge Darkroom, an innovative community gallery and photographic workshop in Cambridge. He has a long term interest in urban and architectural photography and took an important series of photographs of the Kite Area in Cambridge in the 1980s before much of it was destroyed by the building of the Grafton Centre. Roy runs an excellent web site and blog on Photography, Photographers and Photographic Ephemera, called The Golden Fleece, http://the-golden-fleece.co.uk . Subjects, styles, advertising, other relevant information: There is an advertisement in the Cambridge Chronicle on 28th February 1857 "Photographic Portraits taken by the improved Collodion Process by J.Hankin, 18 Rose Crescent, Cambridge. Prices from two shillings"
Subjects, styles, advertising, other relevant information: Rachel Hanlon appears in Kelly's Directory in 1906 as a photographer at 40 Westgate Peterborough. This is believed to be Rachel O'Hanlon b: 1857 Tunstall Staffordshire. In 1891 Rachel was living at Alsager, Cheshire, with her husband William Palliser O'Hanlon (b: 1849 Co Cork Ireland). With them were their three daughters, Minnie (b: 1876 Ipstones Staffs), Adah (b: 1882 Talke Staffs) and Miriam (b:1886 Endon Staffs). Rachel's husband was a physician and surgeon. In 1898 William Palliser O'Hanlon died. By 1901 Rachel was living in Milton Staffordshire, head of household and a boarding house keeper, accompanied by daughters Teresa (b:1882), Miriam (b:1886 Endon Staffs) and Esther (b: 1893). Two young men were boarding with them. By 1911 Rachel was a widow and her occupation was a "photographer", She was working from home on her own account at 108 Norfolk Street, Kings Lynn, Norfolk. With her at that address were: her sister Minnie, (b:1862 at Tunstall Staffs), daughter Esther (b:1893 Tunstall Staffs), daughter Adelaide Tayler (b: 1886 Endon), her husband Charles Tayler and their two children, Norman and Keith Tayler. In addition to Rachel being a photographer, daughter Esther was also a photographer, employed at home by Rachel, and the son in law, Charles Tayler, was a cinematograph proprietor. Presumably at some point around 1905/6 Rachel was living in Peterborough working from 40 Westgate, or had opened a second studio at that address. Subjects, styles, advertising, other relevant information: In the 1939 Register William, a single man, was shown as a "Photographer, camera operator". He was living at the above addrress with two ladies, Catherine E English b:1879 and Catherine Padgett b: 1872. Details of his employer are currently unknown. Subjects, styles, advertising, other relevant information: The Cambridge Evening News, 19 Sept 1991, reported that photographer Lesley Harper of Classic Photographic of Histon and Fulbourn had just completed a prestigeous project producing detailed photographs of a representative US pilot involved in the Desert Storm operation. She took over 400 photographs to be used to produce a bust and other sculptures of the pilot for a number of USAF bases. "Classic Photographic" was described as a firm of portrait and wedding photographers with a modelling studio in France. Lesley appears in the 2000 Cambridge Yellow Pages as a specialist wedding photographer in her own name. 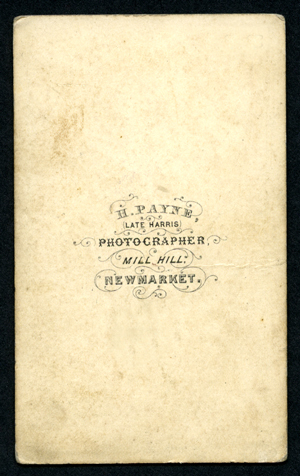 Subjects, styles, advertising, other relevant information: See below example reverse of carte de visite by H Payne, Mill Hill, Newmarket, indicating that his business predecessor was Harris. No obvious trace in the 1871 Census. References: No trace in local trade directories. Subjects, styles, advertising, other relevant information: In 1891 Frank Harris is listed as a photographic artist, living at 226 Cromwell Road, Peterborough with his family. His family comprised his wife Kate, b:1866 Tonbridge Kent and children Archibald b:1886 Sevenoaks Kent and Mabel b: 1889 Lewes, Kent. By 1901 Frank had changed his profession and moved with his family to Kent. He was an umbrella manufacturer living at 126 High Street, Tonbridge Kent. Subjects, styles, advertising, other relevant information: At the present time all that is known of this photographer comes from the chance survival of one of his / her cartes de visite, depicted below. This appears to date from the 1860s - the mount has square corners, and caries a simple belt design with the photographer's surname, the address at 5 Chesterton Road Cambridge and a negative no - 389. The image of a middle aged lady is badly faded and has been carelessly stuck upside down on the mount. The address at 5 Chesterton Road was that of photographer Frances Nichols. Frances was at this address in 1861 when she was a lodging house keeper, but ten years later, when she was 66 years of age, her occupation was shown as a photographer. There is nobody with the surname Harrison at the address in the census returns of 1861 or 1871. Frances' husband, John Nichols, died in 1865 and by 1869 she appeared in the Kelly's Directory as a photographer at 5 Chesterton Road. 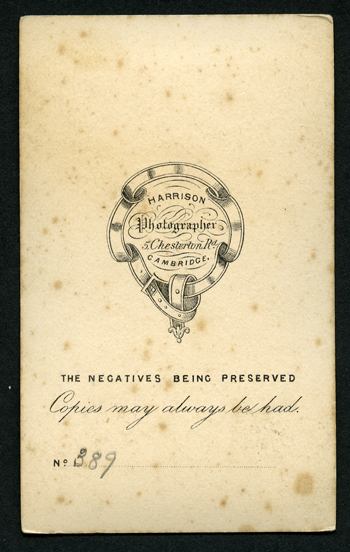 Harrison may have been an employee of Frances, he could have been an occupant of 5 Chesterton Road before Frances moved there, or he could have been a lodger there who got Frances into the photographic business. Hopefully more information will come to light in due course enabling this photographer to be identified. Subjects, styles, advertising, other relevant information: In the 1901 Census Edith was shown as a photographer's assistant, living at 16 Milton Road Cambridge, stepdaughter to the head of the household. In the 1911 census Edith was again shown as a photographer's assistant, at 23 Collier Road Cambridge, the home of the Irons family - She was the step daughter of George Irons, b: 1851 Swaffham Prior Cambs, a butler and daughter of Mary Ann Irons b:1852 Dartmouth. Subjects, styles, advertising, other relevant information: The 1939 Register lists Richard as a retired photographer, at the above address. At the same address was Julia Harvey b:1871. Subjects, styles, advertising, other relevant information: Betty was shown in the 1939 Register at the above address with her parents, Henry F Doone b:1889 and Ruby M Doone b:1892. Also living there was brother Richard E Doone b: 1920. Betty was shown as a commercial photographer, seeking work. In 1940 she married Eric H Hasdall. Her employment history as a photographer is currently unknown. In 2002 Betty and Eric were still in Peterborough at 8 Ivy Grove. Subjects, styles, advertising, other relevant information: The only hint we have that George Frederick Haseldine was a photographer comes from a single copyright submission he made to Stationers' Hall in 1906. He does not appear in local directories as a photographer, nor is photography shown as his main occupation in any census returns. At best therefore photography was a secondary occupation for George and time will tell whether any examples of his work come to light. In 1891 George was a clerk, living with his parents, at the Wansford Post Office where his father, Thomas Haseldine, was the postmaster. In 1892 George married Emma Smith, b:1857 at Wansford, a farmer's daughter. By 1901 George and Emma had a three year old daughter, Dorothy, and the family were still living in Wansford, with George employed as a post office clerk. On 13th November 1906 George submitted to Stationers' Hall for copyright purposes a photograph he had taken of the exterior of Water Newton church, Huntingdonshire: Copyright owner of work: George Frederick Haseldine, Wansford, Northamptonshire. Copyright author of work: George Frederick Haseldine, Wansford, Northamptonshire. Form completed: 13 November 1906. In 1911 George, Emma and daughter Dorothy were still living in Wansford, but George's occupation was a rate collector and the Secretary of the Odd Fellows Friendly Society. Address: 2 Felton Street, Cambridge in 1985, by 1990 and at least until 2000 at 22 Derby Road, where Edward Leigh had his custom built studio. Subjects, styles, advertising, other relevant information: photo library and general commercial photography. Dona was reported as having started her career with the horticultural magazine, "The Grower". She came to Cambridge around 1967 and became well known as a freelance photographer specialising in photographing children in playgroups and their homes. The Cambridge Evening News 14 June 1991 reported that Dona Haycraft was exhibiting some striking cityscapes at The Galery, Fen Ditton. 2) Photograph of the new 'Agriculture' building of Cambridge University. Form completed: 22 April 1910. COPY 1/544/192. A number of William's photographs are held on deposit in the Cambridgeshire Collection and he is recorded in the Cambridge Antiquarian Society Photographic Record Donors 1932. References: www.maa.cam.ac.uk. Mike Petty, Eye on the Past, Cambridge Weekly News 13/11/1991. Subjects, styles, advertising, other relevant information: In 1871 Edward was a "stationer and music teacher" in High Street March, the son of a cabinet maker. In 1881 he was in the same location an "organist and stationer", in 1891 "teacher of music, bookseller and stationer". In 1901 He was a "bookseller, stationer and music teacher", two of his sons, Albert Edward and Arthur, assisting in the business and a third son, Ernest, was a printer. In the 1911 census, EC Haylock is shown as "bookseller, stationer and dealer in fancy goods" at 4 High Street March Cambs, living with his wife Sarah Ann (b:1846 Holbeach Lincs) and daughter Edith Mary (b:1884 March). He published local postcards - actual photographer not known. Subjects, styles, advertising, other relevant information: No trace has been found of this firm in local Peterborough directories. Their operation in Peterborough is demonstrated by the cartes de visite below. 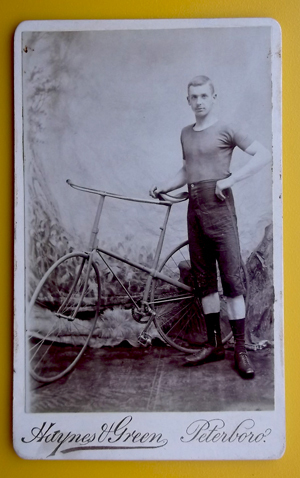 The first is marked in manuscript as a studio portrait of "Jack Rowe, Champion Cyclist": a very athletic looking young man standing holding a lightweight (for the period) bicycle. 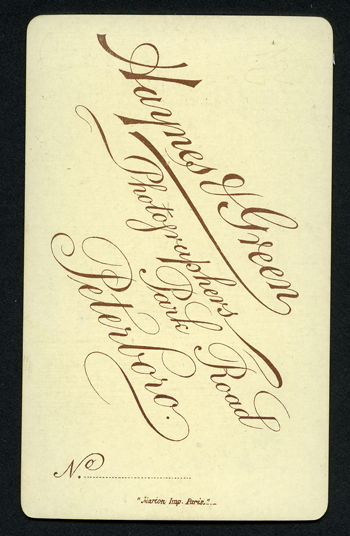 The rear of the carte, printed by Marion & Co, Paris, simply states "Haynes and Green, Photographers, Park Road, Peterboro" - it is from negative no 931. (Simon Shirley Collection) c.1880s? 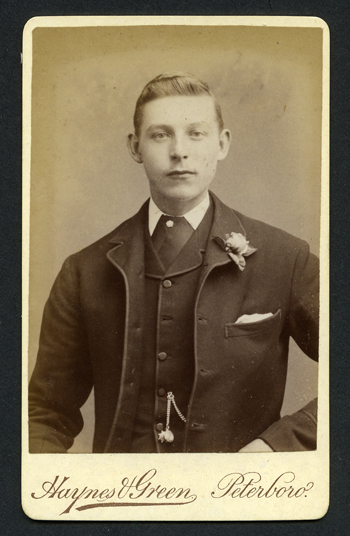 The second carte de visite of a young man with floral buttonhole is of identical format, but lacks a negative number. The Marion code reads: "Marion. Imp. Paris. "_._ (author's collection). 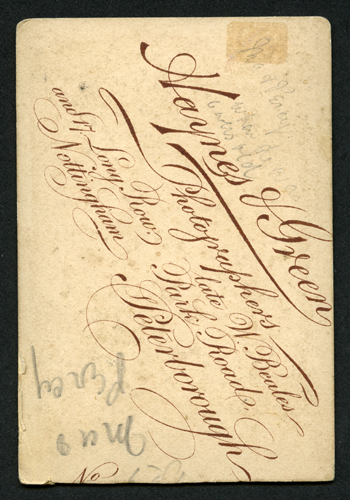 The third carte de visite, cropped top and bottom to fit in an album, shows that this Peterborough firm was in fact the Nottingham photographic partnership of Frederick Haynes and William Green,17 Long Row Nottingham, which had also taken over the local Peterborough studio of Walter Beales. 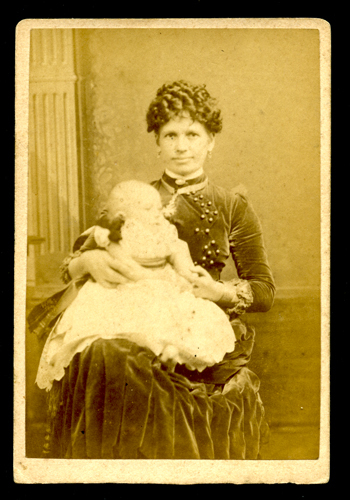 This third carte (author's collection) is of a lady with curly hair with baby, with, in manuscript on the reverse, the legend "Mrs Percy when she was six months old". Below is the notice from the London Gazette of 24th September 1886 dissolving the Haynes and Green partnership - the business then to be continued by William Green. Perhaps the expansion of the firm into Peterborough stretched them too far. The 1881 census does not show the address of 17 Long Row as a photographers, so the firm may only have existed after April 1881 and before July 1886. The partnership advertised regularly in the Nottingham Evening Post between 15th May 1884 and 29th November 1884, proclaiming that "The Best and cheapest portraits can be obtained at Haynes and Green's photographers 17 Long Row Nottingham". The following are probably the partners concerned - a powerful combination of an experienced portrait painter and a photographer. Frederick Haynes was the son of Frederick Haynes a portrait painter (b:1832 at Carrington Nottingham). In 1861 Frederick (senior) and his family were resident at Carrington Street, Nottingham. Frederick (senior) was married to Mary Jane Haynes (b:1839 Newstead Notts). Their children were Frederick (Junior) (b:1859 Chillwell Notts), and Alice (b:1861 Notts). They had a live-in servant, Anna Royce. In 1871 Frederick (senior) and his family were living at Washingborough Lincolnshire. The family had grown with the addition of Elleanor (b:1865 Nottingham), Horace (b:1867 Lincoln) and Charles Dickson (b:1870 Washingborough Lincs). 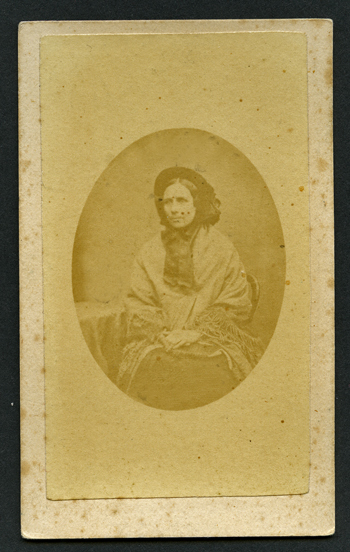 The family had a general servant, Alice Bands (b:1850, Lincolnshire). By 1881 Frederick (Senior) was a widower living in Basford, Notts. Frederick Haynes (Junior) was living with his younger brother, Horace, at 79 Caroline Street, Nottingham. Frederick (Junior) was also shown in 1881 as a "portrait painter". 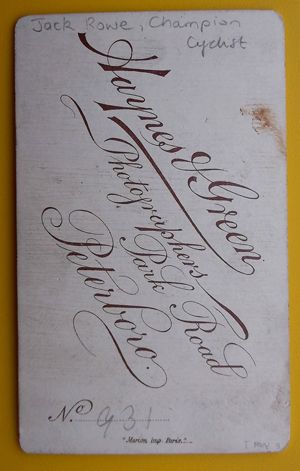 After the end of the partnership with William Green, in 1891 Frederick Haynes Jnr was working in photography as a colourist and enlarger, he was living at 8 Lichfield Road, Mile End, London with his wife Emily Ruth Haynes b:1862 at Bicken Lincs. In 1901 Frederick Haynes was living at Lewisham where his occupation was shown as a "photographic enlarger" and an employer of others. Living with Frederick and his wife Emily was a boarder, Howard Hill, b: 1879 at Kentish Town, who was employed as a "photographic enlarger", presumably by Frederick. In 1911 Frederick was still a photographic colourist, an employer, working from his home at 12 Hawstead Road Catford with wife Emily and an adopted daughter, Olive Constant Lee (b:1904 Lewisham). Frederick died in Lewisham in 1912. William Green was born in Basford Notts in 1850. In the 1871 census he was living in Maude Street, Canning Town, with his wife Elizabeth and working as a labourer in India Rubber. By 1881 William was living in Nottingham at 7 Sherwin Street. He was a "commercial traveler in photography". Living with the family was an apprentice photographer, Christie Ventham (b:1864 at Canning Town). By 1891 William had moved to Camberwell. He was then described as a "photographic operator", his daughter Rosetta (b:1875 Canning Town) was his "photographic Assistant". By 1901 William was at St Johns Hill Battersea - a photographer working from home. Three of his daughters were described as "photographers assistants" working from home. The daughters were: Ada Elizabeth (b:1873 Canning Town), Gertrude Maria (b:1879 Basford Notts) and Ethel Beatrice (b:1882 Basford Notts). William died in 1920. References: No trace has yet been found of this firm in local trade directories. Subjects, styles, advertising, other relevant information:Subjects, styles, advertising, other relevant information: Laurie "Hummer" Haynes ran the Post Office & grocer's shop at the corner of Norfolk and St Matthews Streets Cambridge. 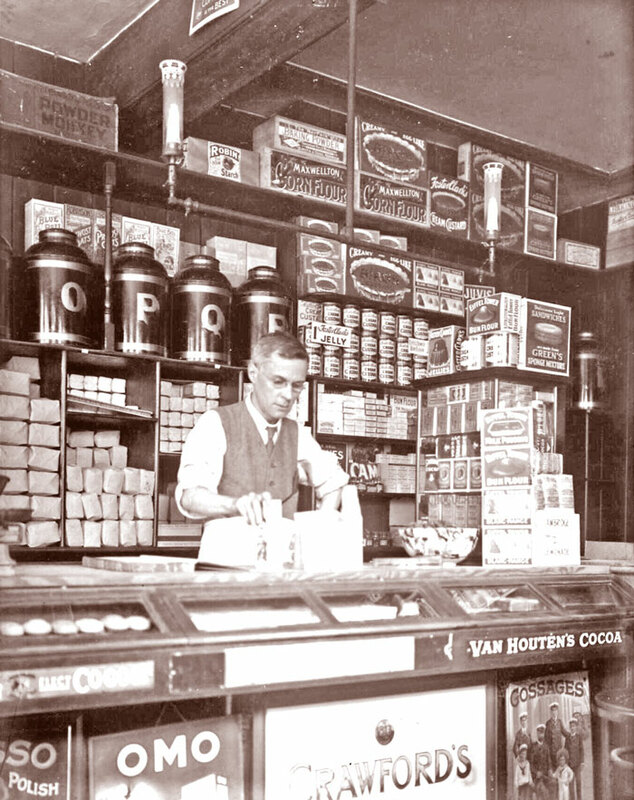 His father, Moses, had started the business when Norfolk Street was built in the 1880s. In the 1901 Census Laurie was shown as a grocer, a shopkeeper and employer, at 90 Norfolk Street, where he lived with his wife Annie and daughter Dorothea Olive. The family had a live-in 14 year old servant. In the 1911 Census Laurie, his wife Annie and three daughters, Olive, Rita and Jean, were listed at 90 Norfolk Street Cambridge where Laurie was then the sub-postmaster and grocer. Kelly’s Directory shows Laurie as the sub postmaster in 1935/6 but he retired in his early sixties and his shop was taken over by the Co-op. By 1939 he had set up home at 82 Hills Road, near the top of Bateman Street in a house rented from Gonville and Caius College. Laurie’s grandson, Francis Hookham, remembers him as a serious minded individual with great attention to detail. His record keeping in his business was phenomenal, to the extent that he could quote the price paid years earlier for any item of stock. He was prudent and even saved, and re-cycled his bus tickets. The neatness of his shop is also testimony to a man who liked order and had a good eye for display. His careful management and record keeping meant that his business was profitable, as evinced by his ability to enjoy a few of the luxuries in life; the odd trip to London for a Turkish bath anda small cabin cruiser, “Homely”, on the River Cam. Laurie’s love of photography probably started around 1910, the date of his earliest surviving images. He joined the Cambridge and District Photographic Society in February 1916. His Grandson believes that Laurie took photographs mainly for his own pleasure and interest and for his family and not for any commercial purposes and indeed no prints have come to light on mounts advertising Laurie’s name. Laurie had a good eye for detail and was a careful and precise technician. A number of his photographs appear in the illustrations index of the Cambridgeshire Collection and they also hold 119 of his negatives. His chosen subjects were his family and the immediate surroundings in or near Cambridge, local mills, river scenes, and anything unusual which caught his interest. In his retirement Laurie was able to devote more time to his photographic interests, converting one of the basement rooms at 82 Hills Road into a darkroom. Below are three of Laurie’s photographs, all scanned from his negatives which are now in the Cambridgeshire Collection and are reproduced with their permission. The first is a self portrait showing Laurie behind the counter in his Norfolk Street shop around 1910 (catalogue P.HAY.K1). 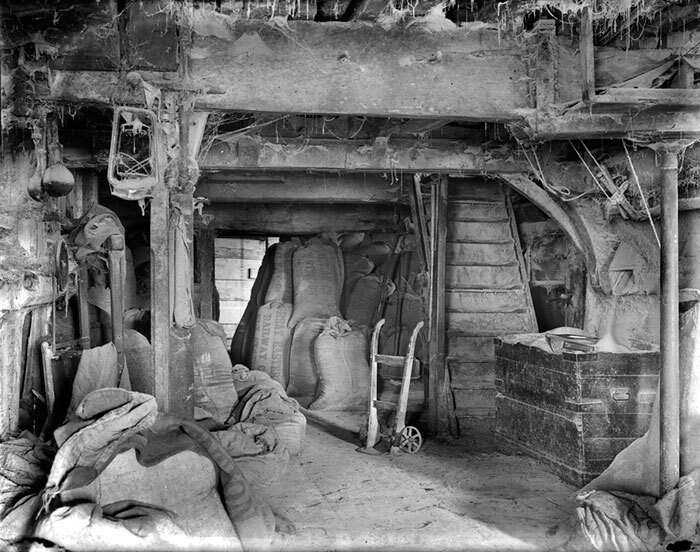 Next is an interior shot, probably from Grantchester Mill – a very well handled and atmospheric interior taken in low light, even the lettering on the Great Eastern Railway Co sacks in the background is readable. 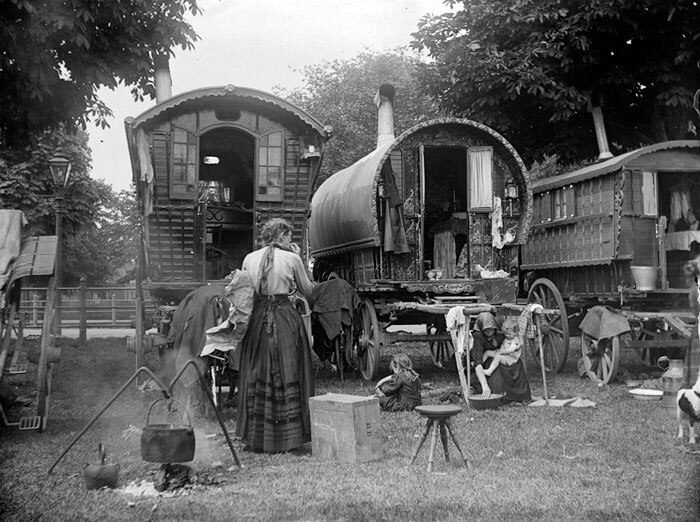 The third image, full of detail and razor sharp, is of Romany Gypsies camped on Midsummer Common, Cambridge. References: Mike Petty, An Eye On The Past Cambridge Weekly News 20 Nov1991, personal recollections of Laurie’s grandson Francis Hookham. References: Mike Petty, The Photographers, (a handlist of local photographers), Cambridge, Cambridgeshire Collection, 1992. The Kelly's directory entry of 1892 shows CHB Hazeldene as a photographer in Chatteris - there is no trace of such a person listed in the census returns for England. There was also in 1892 in London Road Chatteris a Charles Hazeldine, castrator and baker, the entry preceding that of CHB Hazeldine - could this possibly be a misprint in the directory of some sort?